Isaac Titterton was born about 1800. Family history research indicates that Isaac Titterton was a brush maker from Madeley in Shropshire, England. Not far from Madeley there is a place called Tittertstone Clee, a significant hill in the area, although the link between the surname and place has not been verified as yet. Titterton arrived as a convict to Sydney in 1820 on the Mangles. He, with a group of others, pleaded guilty in 1819 and was sentenced to 14 years transportation to Sydney for the charge of having in their possession forged and counterfeit bank notes, knowing them to be forged. There is no indication of whether he or any of the group had made the forged notes. One of his co-accused by John Webster, a carver by trade, who was pardoned by Governor Macquarie due to his skill as a carver at Government House. He married Mary (1812–53), the daughter of Charles Hadley and Sarah Phillips, at Windsor on 25 February 1830. Sarah Phillips, the daughter of ex-marine Thomas Spencer and convict Mary Phillips, was born on 27 November 1791 at Norfolk Island. Isaac and Mary’s four sons and one daughter were born in Sydney, Castlereagh and Parramatta. Titterton’s wife’s sister Isabella Hadley married fellow Alderman Charles Jenkins. Isaac Titterton died on 3 September 1852, aged 50, and was buried at Devonshire Street, later relocated to the Church of England Cemetery at Rookwood. A Memorial in St James Church of England in Sydney commemorates his second son Charles Hadley Titterton, 1833-34. Isaac Titterton was a convict who arrived in Sydney on 7 August 1820 on the Mangles. By 1828, he was a shareholder in the Bank of NSW. Titterton was a publican. He became the licensee of the White Horse Cellar in George Street, Sydney, in June 1834. From 1837 to 1839, he was the publican of the George and Dragon also in George Street. He became well known as the licensee of the Talbot Inn in George Street from 1839 to 1845. This hotel, also known as the Coach and Horses, was situated halfway between Bathurst and Wilmot streets and was the starting point for coaches to Windsor and the interior. In 1850, he had the White Horse Tavern in George Street. Titterton had married into the Hadley family who already had connections with the coaching and inn business. 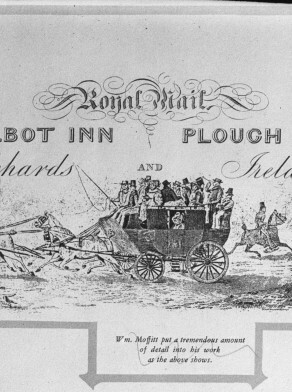 In January 1844 he advertised his inn as the only booking office for the Bathurst Mail and in January 1845 he was selling seats on the Goulburn Mail. In October 1844 he and John Ireland were granted a coach license. It appears that Titterton was also involved with mail runs from Sydney to Campbelltown as well as from Brisbane to the Darling Downs. In 1843 Titterton had advertised for sale 500 cattle on the Lachlan station and by October 1844 he was selling horses at Titterton’s Livery Stables. In 1847 he also had wholesale general stores in Sydney. Isaac Titterton was Alderman for Macquarie Ward, 1 November 1845 to 31 October 1849.